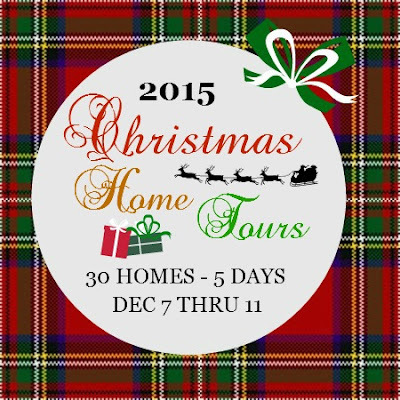 Hi everyone and welcome to my Christmas Home Tour! I am so excited that you took the time to stop by, please do come in and take a look around. 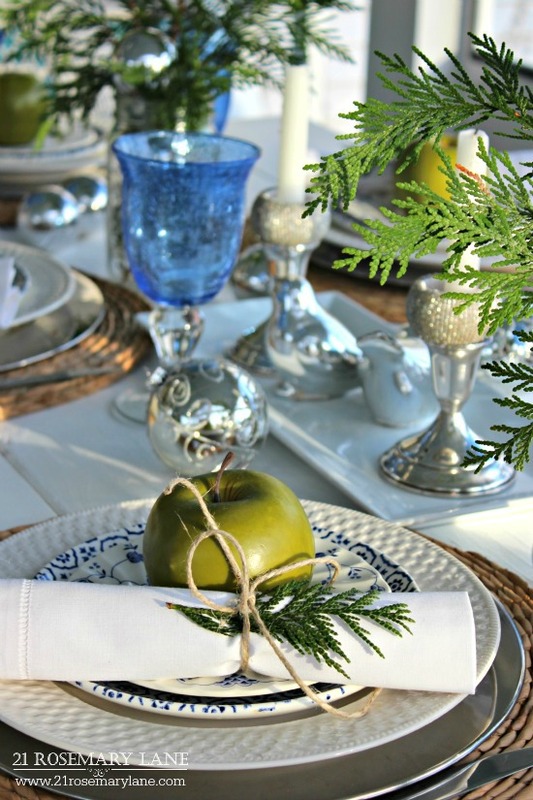 If you arrived from the blog Thrifty and Chic welcome, I hope you enjoyed Alicia's tour. 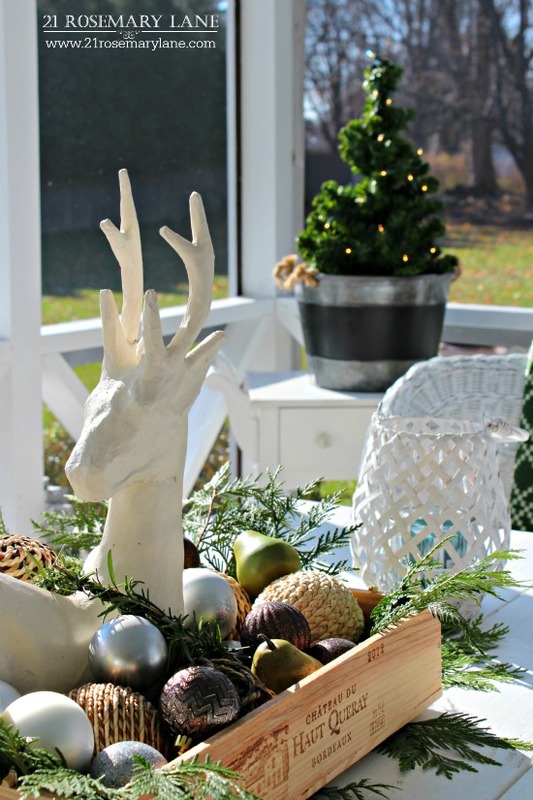 If you haven't seen it then you must head over to check out her stunning holiday decor. Christmas is such a wonderful time of the year, filled with so many pretty things. 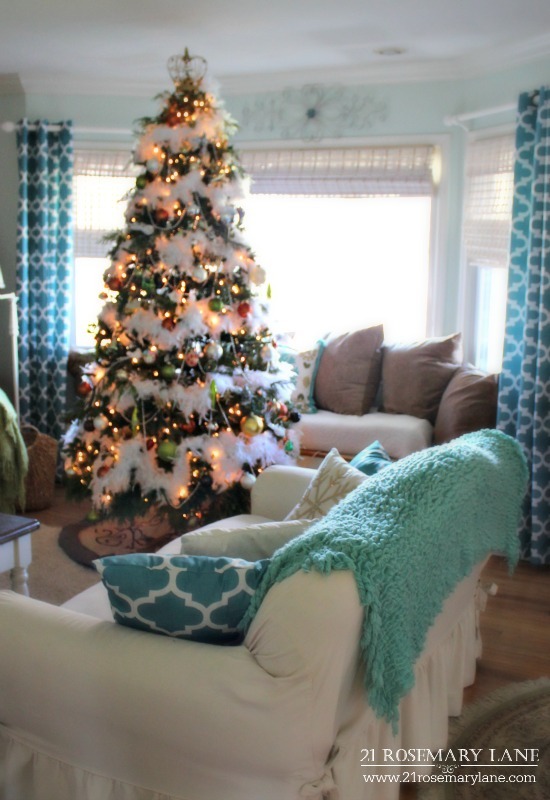 I love all the twinkle lights and the Christmas trees, candy canes and holiday guests. But what I love most is the reason for the season, a tiny little baby born some 2000 years ago. 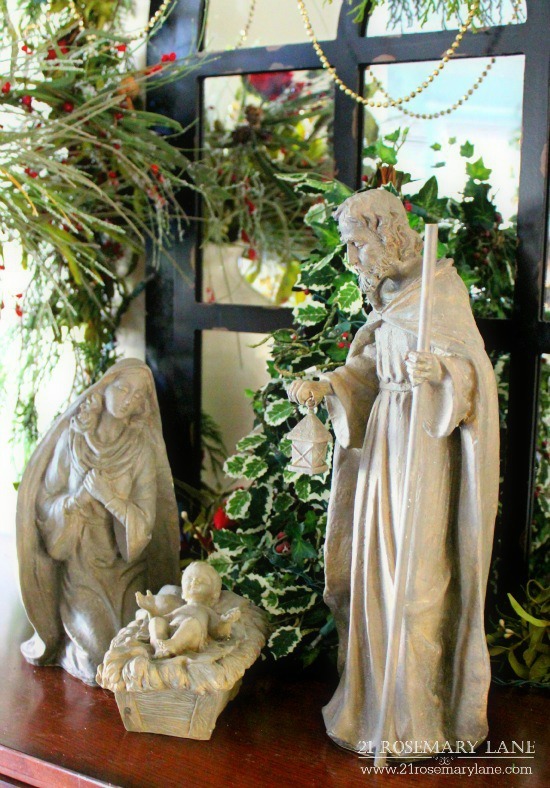 Our Nativity is traditionally displayed in the entry of our home to remind us, first and foremost, that the baby Jesus is why we celebrate Christmas. Our living room is also our family room. 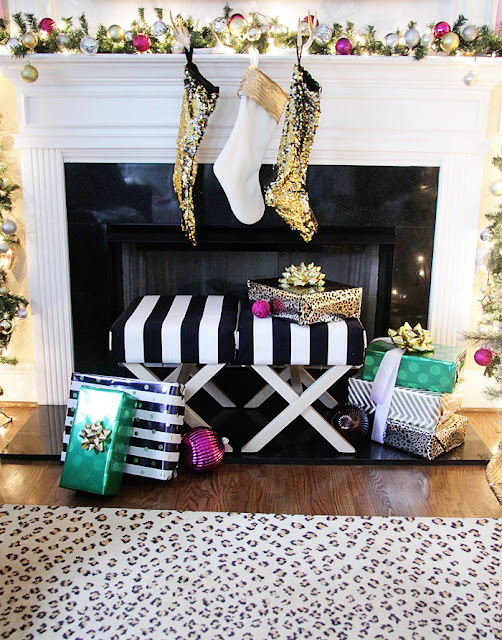 This is where guests sit and visit, where the kids open their gifts on Christmas morning, and where we enjoy our favorite holiday movies. So I do go a little crazy decorating in the living room. This year the tree is trimmed with a feather garland (it's actually feather trim) I purchased at Walmart in the craft section. 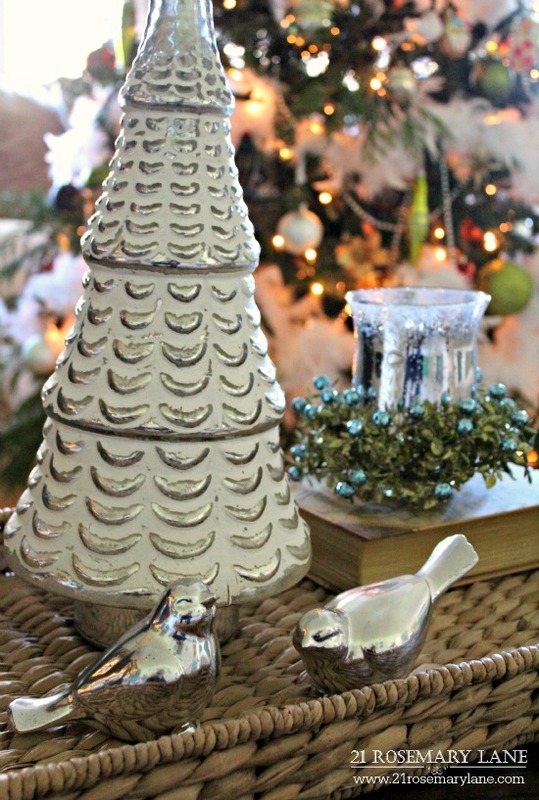 In keeping with the feather theme, I picked up some darling clip-on bird ornaments. 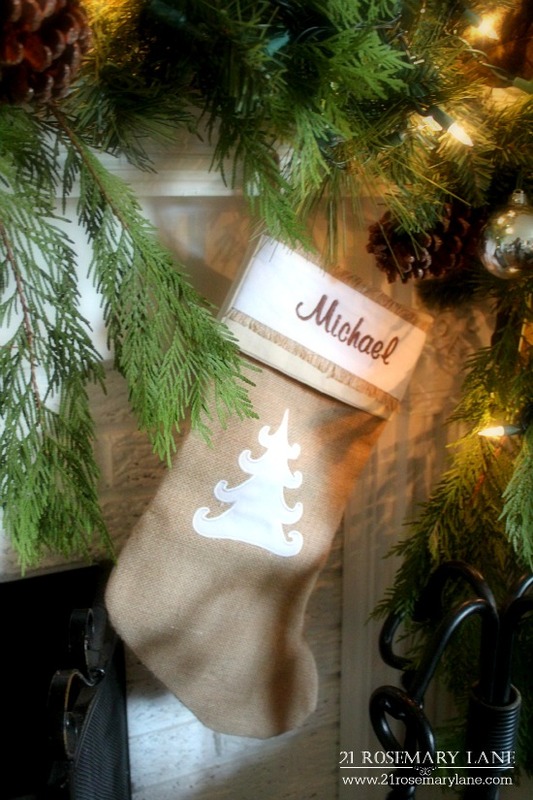 ...and of course the children's 'stockings are hung buy the chimney with care'. Now let's head on outside. 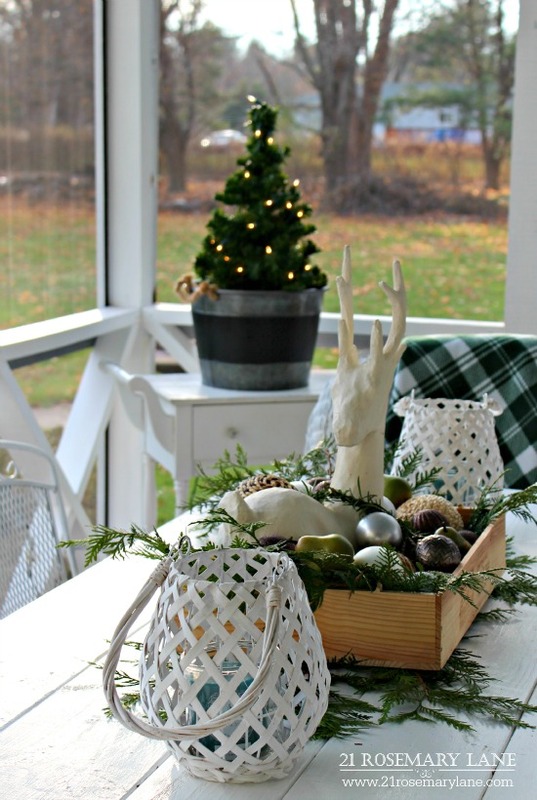 Although we have been enjoying some of the most beautifully mild weather your could imagine for almost mid December, it would would be nice to have a little snow on the ground for the holidays. 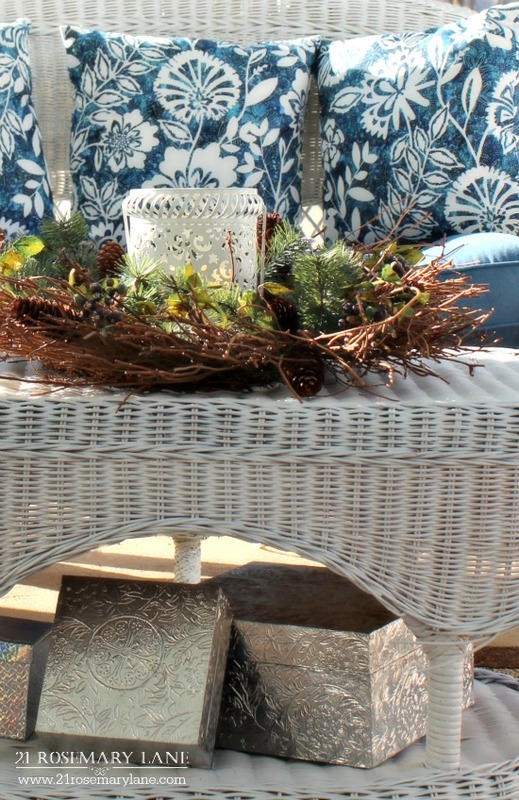 But on the other hand it is perfect for outdoor entertaining. 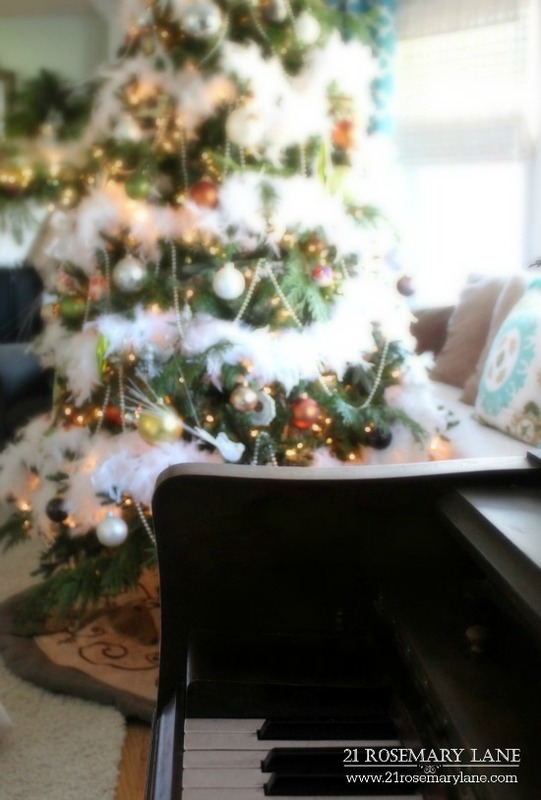 And even though I tried to keep the outside Christmas accents simple, I did break down and decided to buy a tree. 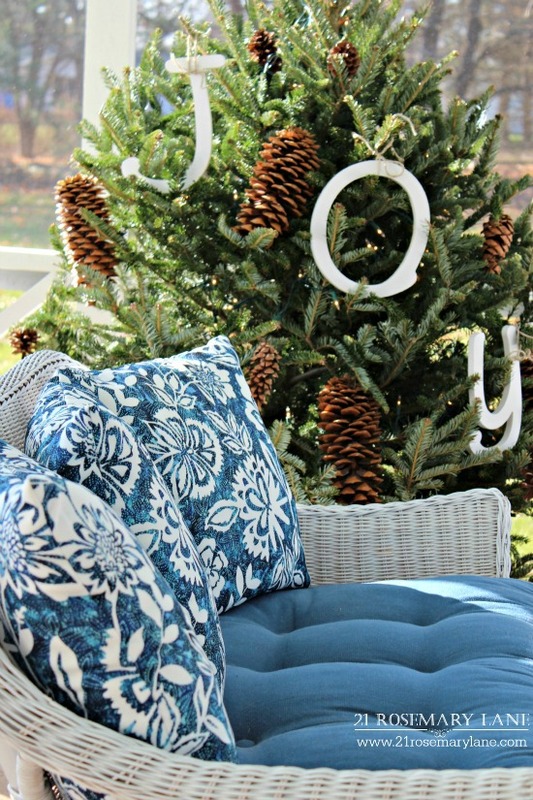 I trimmed it with white lights, varied sizes of pine cones, and the word "JOY". 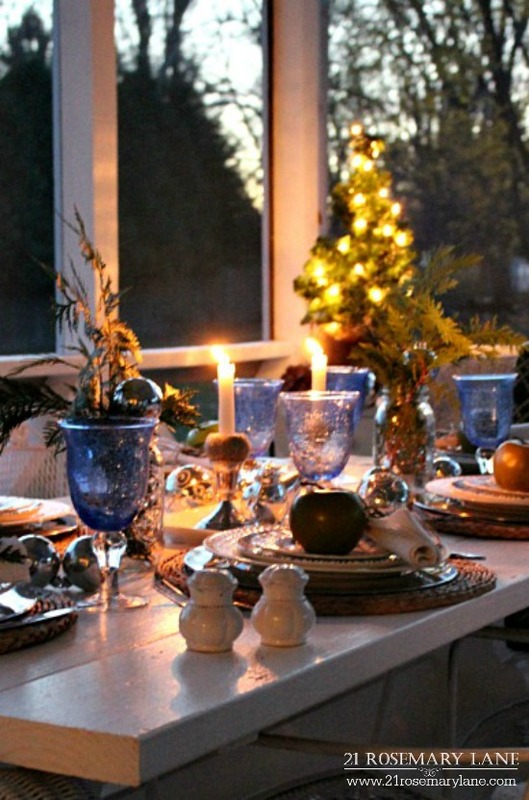 Here is the table set for and intimate Christmas party of six. I still have a little more decorating to go in our dining room and in the kitchen when our project there is finished. I also want to tell you about a beautiful gift I received from my dear sweet friend Judy of Gold Country Cottage fame. 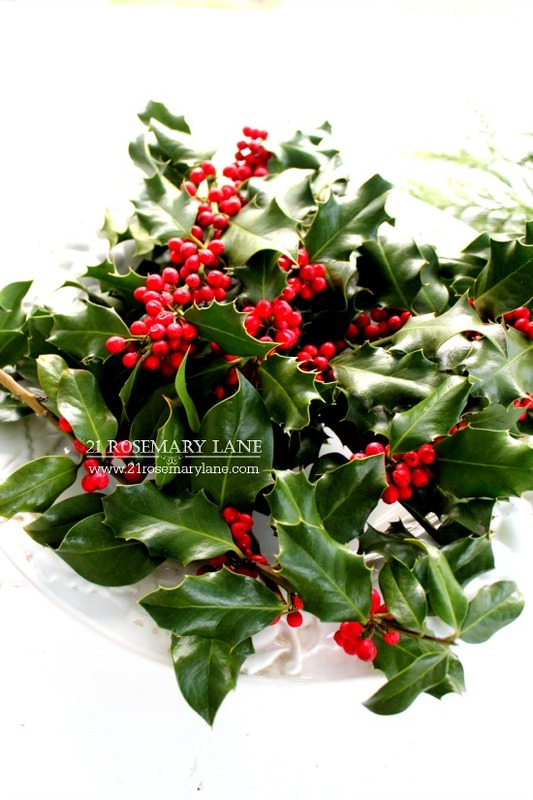 Judy sent me this gorgeous holly straight from her garden in northern California. 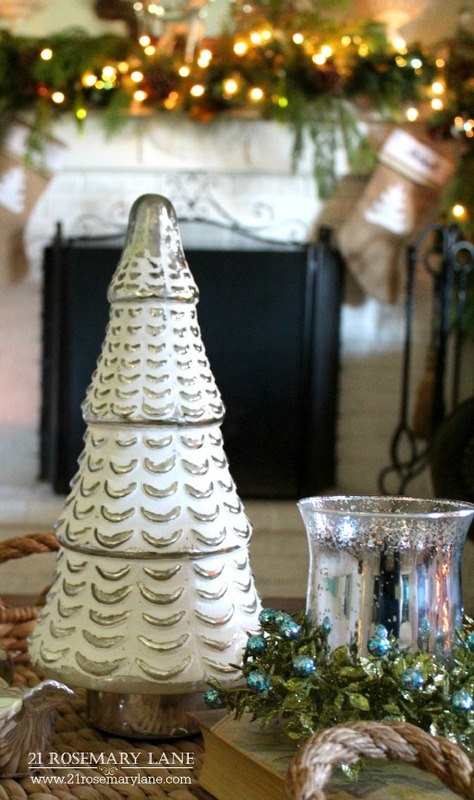 I plan to use it in my dining room this holiday season as part of a centerpiece I want to create. (I will be posting my dining room in the days to come so stay tuned.) The holly Judy sent is so magnificent it almost doesn't seem real, but I guarantee you that it is..lol! Take a look! And that's today's tour. I really hoped you enjoyed milling around my home for a few minutes. I certainly enjoyed your visit and I hope you will stop by again. 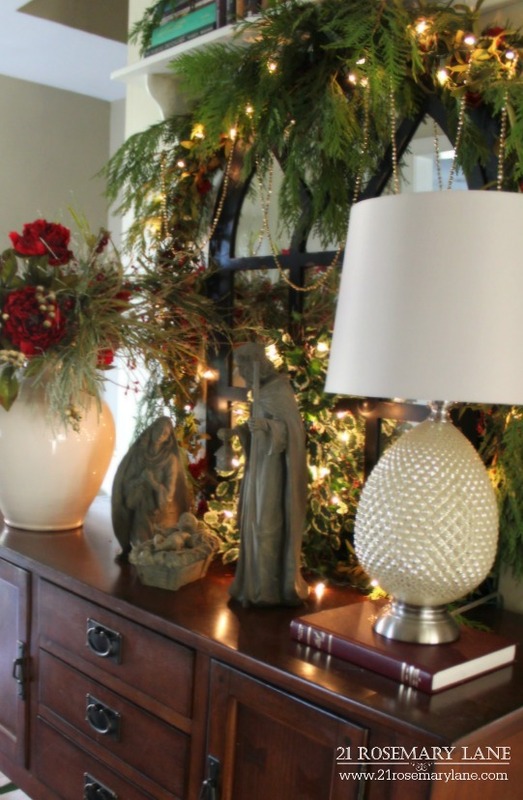 I want to say a huge thank you to my dear friend Marty from the blog A Stroll thru Life for putting together this marvelous collection of Christmas Home Tours for your enjoyment. 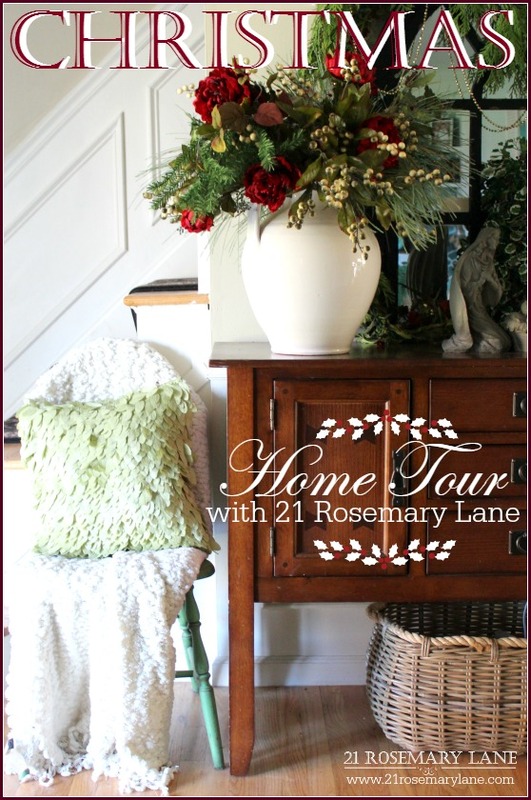 And thank you so much Marty for including 21 Rosemary Lane. It has been a pleasure, as always, working with you. Next up on the tour is by Mallory and her gorgeous Christmas stylings. 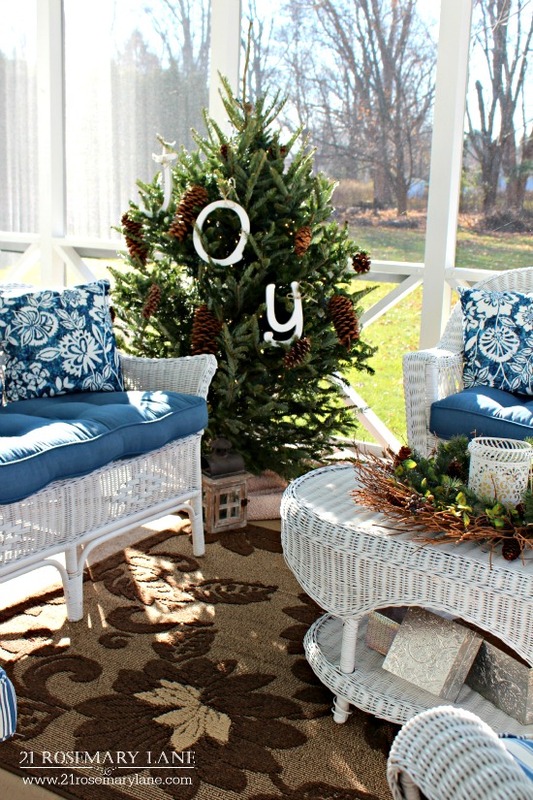 Her blog is called Style Your Senses and I know you will enjoy touring her beautiful home. 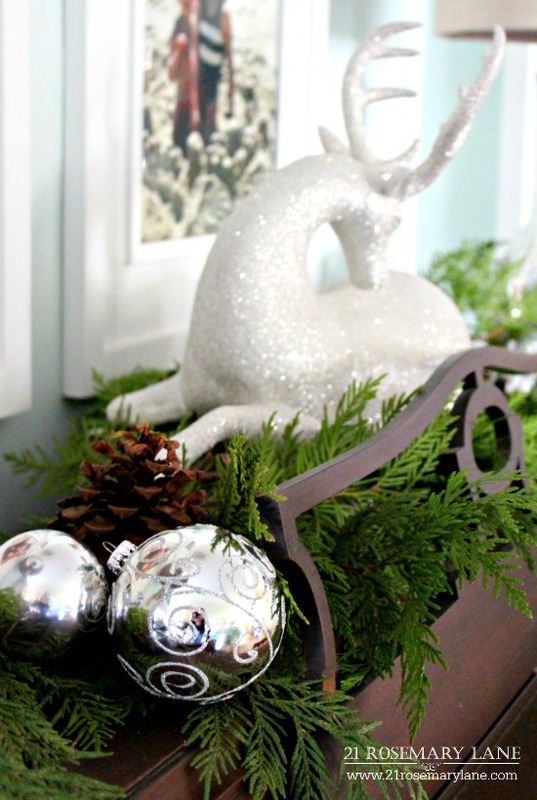 Here is a peek at her fabulous decor. 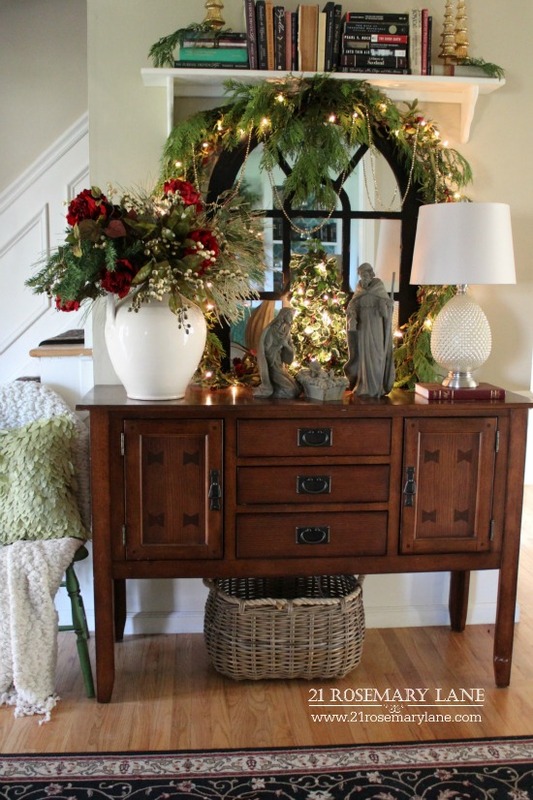 Please make sure you check out Mallory's wonderful Christmas home. The week's lineup is as follows! Barbara How clever to add a feather boa to your tree! It gives it a wonderful ethereal look. But my favorite is your nativity. He truly is the reason for the season. Blessings to you. 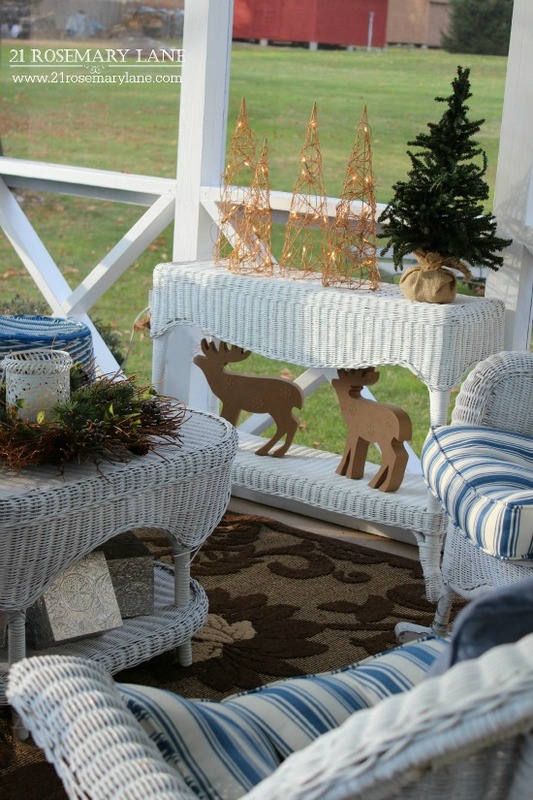 Such cozy details! Beautiful Christmas tour! 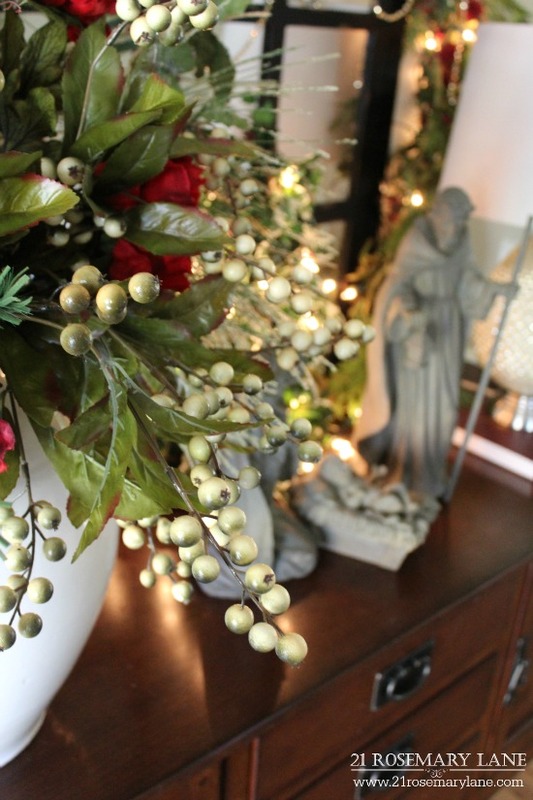 I love everything start at the front with the nativity, such a pretty display with all the lush greenery and your mantel is a work of art. 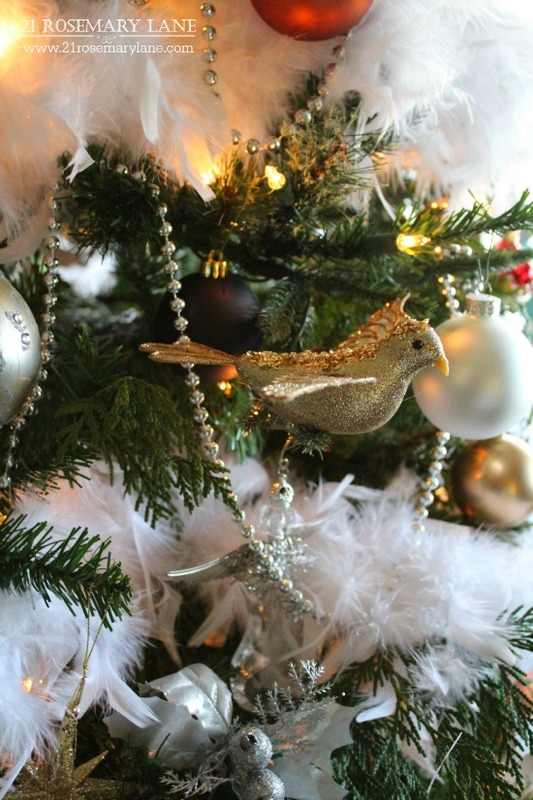 The tree is stunning and who would think to use the feather trim, it looks fabulous. Everything is so pretty and so beautifully done, can't wait to see more. 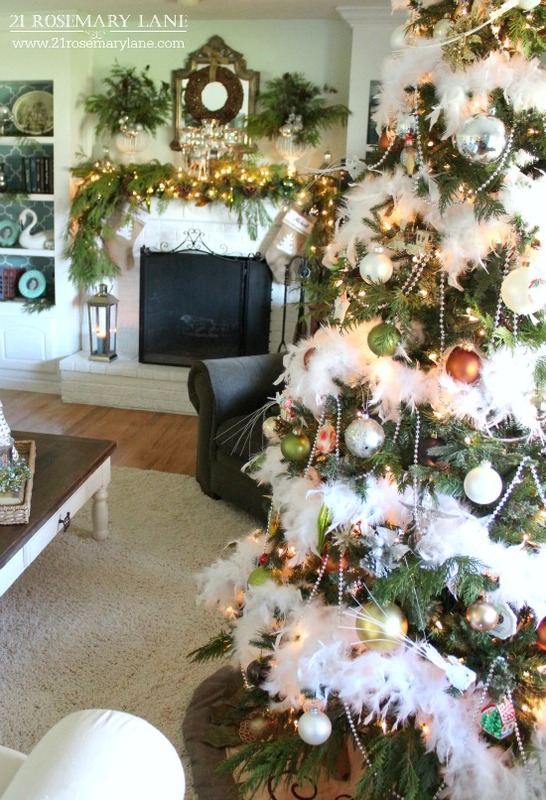 The feather trim in your tree is to die for! I love it! and the rest of your details are perfection! Beautiful tour, Barbara. Loved it! Your home looks beautiful! All the greenery is so lush and elegant! Thank you for proclaiming Christ! Jesus is not only the reason for the season but for EVERY day! Barbara, it's all so beautiful. You have the touch to make everything so special. Gorgeous, Barbara! 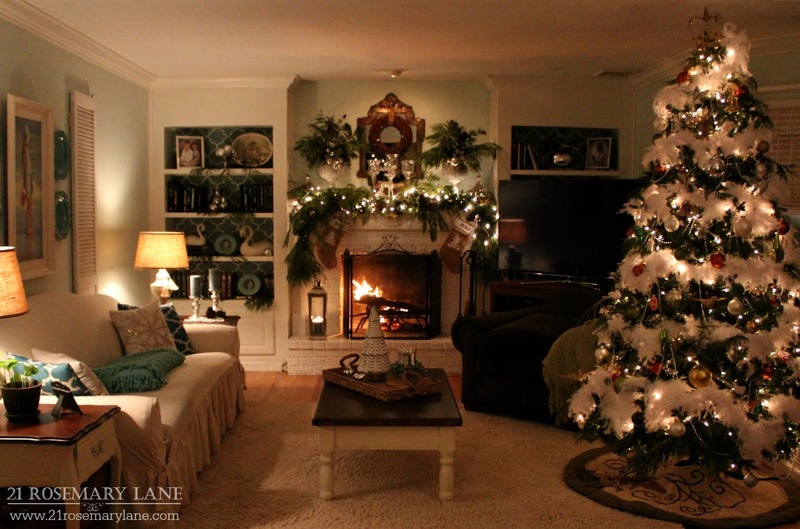 It was so fun to see your home decorated for Christmas....stunning. Barbara, everything is so pretty! I am always in awe of your entry way and the way you've changed it over time. Oh, dear friend, thank you for sharing your lovely home for Christmas!!! I love the nativity at the Entry!!! 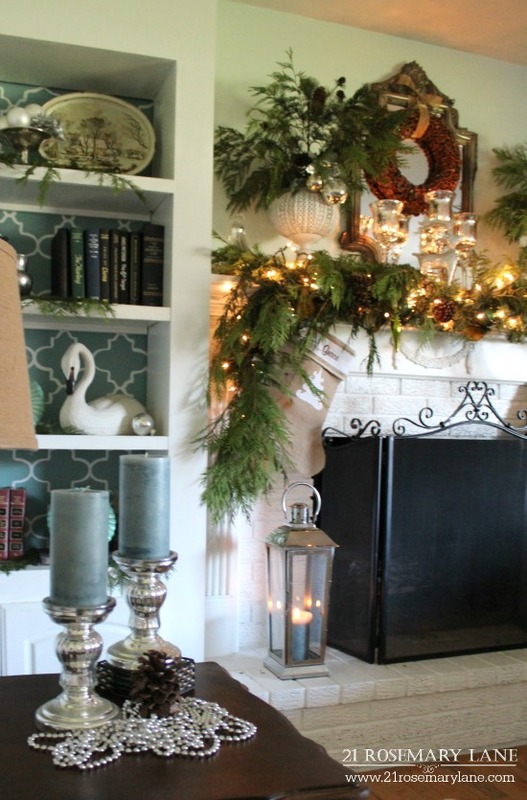 Your mantel is e x q u i s i t e!!! I adore all the mercury silver!!! The entire room breathes festivity at Christmastime!!! 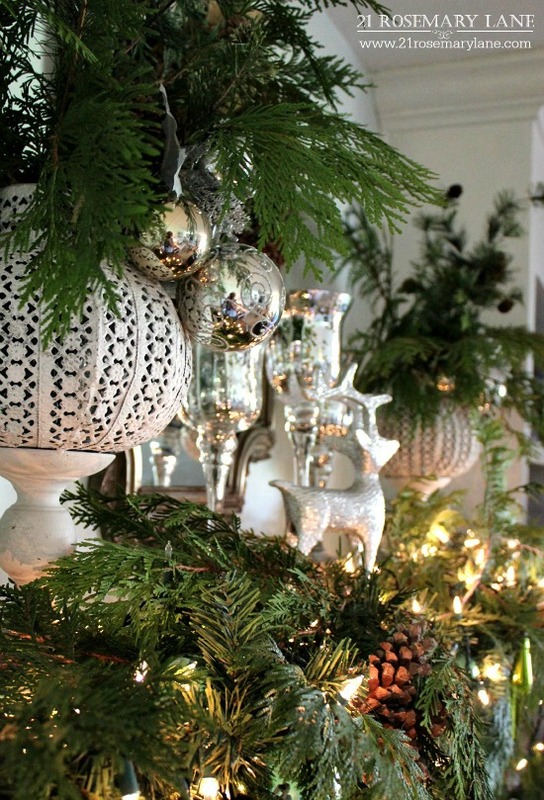 It's always so much fun to tour your home, all dressed up for Christmas is simply gorgeous! I love the screened porch!